Mariely Garcia began to see herself as a change-maker during her senior year at Richard R. Green High School of Teaching. Garcia and her fellow CFES Scholars had a vision: they wanted to redefine the word perfect. Together, they started the Perfectly Made campaign to empower young people, raise mental health awareness, and ignite self-love and self-worth. Garcia and her team spread their message to the city of New York when they took over Dag Hammarskjold Plaza in midtown Manhattan for the Perfect Revolution rally. “We were a bunch of students in high school and we had this dream that we made happen. I realized we have the power to change our community,” says Garcia, who continues to make change locally and globally by working to make great healthcare more accessible for communities that are lacking. 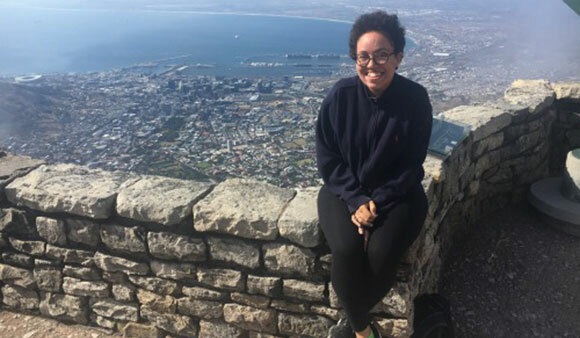 After graduating from Bowdoin College as a QuestBridge Scholar, Garcia received the Watson Fellowship to pursue a yearlong passion project abroad. She traveled to marginalized communities in Ecuador, Guatemala Argentina, South Africa, and Italy to listen to peoples’ stories about how they have accessed healthcare services and information. Garcia’s experiences abroad helped her learn how to be a better person and a better doctor. “How can I be the doctor that shows up in a room and is able to understand my patients and where they are coming from? How can I have conversations about illness in meaningful and relatable ways?” she asks. Garcia tackles those questions in her current role as a project manager for Northwell Health, in New York City, where she gets to research how to be thoughtful about medical procedures. Garcia’s advice for students considering applying for a fellowship like the Watson: “don’t let fear or uncertainty stop you if something excites you.” She explains the application process is long and encourages students to start early, plan ahead, and find a mentor or advisor to help throughout the process. “Don’t get discouraged or intimidated. There’s no reason why you aren’t the best and qualified for a competitive fellowship,” she says.